Vetra's PS/2 and Serial Mouse Protocol Converters allow you to convert PS/2 mouse protocol to Serial mouse protocol or Serial mouse protocol to PS/2 mouse protocol. They are compact, rugged, and easily installed and can be used in a wide variety of applications requiring the cross connection of PS/2 and serial mice. Industrial control, instrumentation, structured test, compatibility test, and data acquisition are some of the many areas where these Protocol Converters have found effective application. Both the VIP-327-PS and the VIP-327-SP utilize Vetra's advanced mouse emulation technology which provides error free boot up to the connected PC and operate transparently with all PC's, PC operating systems, and applications. The VIP-327-PS PS/2 to Serial Mouse Converter allows a PS/2 mouse to be connected to, and operate through any PC's serial com port. The unit is attached in line to the PC's serial com port via a DB9 female / female cable provided with the unit. The PS/2 mouse plugs directly into the unit via the on-board 6 pin mini-DIN connector. The unit is powered from a 5V DC wall mount power supply which is purchased separately. We recommend the VIP-211 , for 100 - 240 V AC 47-63 Hz input, however, you may provide your own supply (see specifications below). After the PC boots up, the PS/2 mouse messages are converted to serial mouse data and delivered to the com port of the PC. Due to the fact that there are several serial mouse protocols, we provide 3 models to cover the most popular protocols. The VIP-327-PS supports the Microsoft 2 button serial mouse protocol. The VIP-327-PS-3B supports the Mouse Systems 3 button serial mouse protocol, and the VIP-327-PS-SW supports the Microsoft IntelliMouse serial mouse protocol. For optimum operation use the appropriate serial mouse driver on the target PC, as the active mouse driver. This can be accomplished manually, after boot up, via the control panel window of the Operating System. If your Operating System does not have the appropriate driver, it can be downloaded from the manufacturer. For detailed information on the serial mouse protocol, please click here. 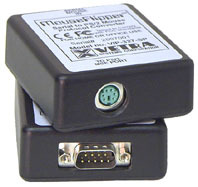 The VIP-327-SP Serial to PS/2 Mouse Converter allows a serial mouse to be connected to, and operate through any PC's PS/2 port. The unit is attached in line to the PC's PS/2 port via a 6 pin mini-DIN male / male cable supplied with the unit. The serial mouse plugs directly into the unit via the on-board DB9 male connector. The unit is powered from from the PC's PS/2 mouse port, so no external power supply is required. After the PC boots up, the serial mouse messages are converted to PS/2 protocol mouse messages and delivered to the PS/2 port of the PC. For optimum operation, the serial mouse used should be Microsoft 2 button serial mouse compatible, and the PC should have a generic PS/2 mouse driver loaded and active. This can be accomplished manually, after boot up, via the control panel window of the Operating System. For detailed information on the serial mouse protocol, please click here. If you experience any difficulties with your WIN 2K or XP Operating Systems not detecting the our device on boot-up, please click here for information on disabling the "fast-detect" setting on your OS. VIP-327-PS: Accepts PS/2 mouse input and converts it to Microsoft 2 button serial mouse protocol for connection to a PC's com port. Requires power supply purchased separately, such as our VIP-211. VIP-327-PS-3B: Accepts PS/2 mouse input and converts it to Mouse Systems 3 button serial mouse protocol for connection to a PC's com port. Requires power supply purchased separately, such as our VIP-211. VIP-327-PS-SW: Accepts PS/2 mouse input and converts it to Microsoft IntelliMouse serial mouse protocol for connection to a PC's com port. Requires power supply purchased separately, such as our VIP-211. VIP-327-SP: Accepts Microsoft 2 button serial mouse input and converts it to PS/2 mouse protocol for connection to a PC's PS/2 port. For International Representatives click here. For both models, connections between the unit and the PC are made via supplied cables. The mice plug directly into the unit. No adapters are required. Dimensions for the VIP-327-PS and VIP-327-SP are 1.02 in H x 2.50 in W x 3.00 in D (2.59 cm x 6.35 cm x 7.62 cm). The housings are molded of black GE Cycolac-T, a high impact ABS material. The VIP-327-SP is powered via the PC's PS/2 mouse port. The VIP-327-PS requires an external power source. We recommend the VIP-211, but you may provide your own supply (5VDC regulated, 300 mA minimum, plug type must be PL06 2.5mm / 5.5mm barrel type with +5V on the center pin). FCC and CE marked. Shipping weight is less than 1 lb per unit. For user instructions for the VIP-327-PS click here. For user instructions in PDF format. For user instructions for the VIP-327-SP click here. For a copy of Adobe's Acrobat� Reader™.